What can be better than the smell of roast brisket and cinnamon wafting from the oven….Real comfort food. I make a large casserole of Tzimmes every Rosh Hashanah. I like to roast the brisket the day before serving. Remove from the gravy, wrap in foil and place in the fridge overnight. Slice the next day which make the slicing much easier and the meat does not fall apart. 1. Place brisket in a large heavy saucepan, cover with boiling water. 2. Add the onion, carrots, whole garlic cloves, peppercorns, bay leaves, salt & ground pepper. 3. Bring to the boil, reduce heat , cover and simmer gently for 3 hours. 4. Remove the brisket to a casserole dish and strain the stock. 4 large potatoes, peeled and cubed. 2. Place 4 cups of the stock into a pot, add carrots, potatoes & sweet potatoes into stock with salt. 3. Bring to the boil and add rest of ingredients including the extra 4 cups stock. 4. Simmer for 15 minutes then pour over the brisket. 5. Cover and place in the oven and roast for 2-3 hours till brisket is tender. 6. Baste the brisket every 1/2 hour. 7. 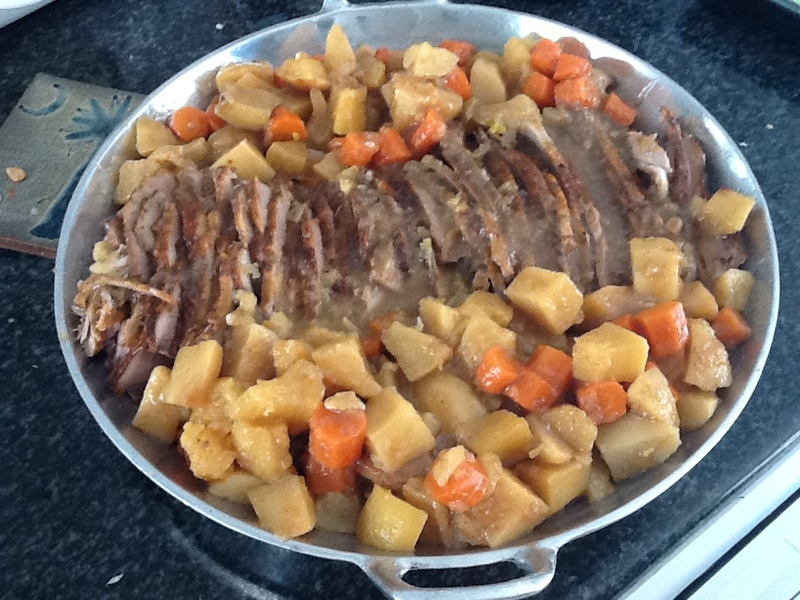 Remove the brisket, slice against the grain and return to the casserole. 8. To warm, cover the brisket and place into a 100C (220F) till ready to serve. The brisket will melt in your mouth!